At age five, Serj Tankian moved with his parents to Los Angeles, California. After high school, he studied marketing. He took singing lessons for four years and also took guitar lessons as a young child. In 1993, he founded the band Soil (not to be confused with SOiL) with Daron Malakian, which later went on hiatus, and later changed to System of a Down. Tankian is not only a member of the band System of a Down, but also has his own record label which is called Serjical Strike Records, a sub-division of Columbia Records. He also performed guest vocals on songs such as Mushroom Cult by Dog Fashion Disco, and Mein by Deftones. He produced "Enter The Chicken" by Buckethead, and provided vocals to the Buckethead songs "We are One," "Coma" and "Waiting Here." With Serjical Strike Records, he endeavors to offer those musicians often ignored by the mainstream a possibility to release their music and be heard. The first release of Serj's new label was Serart, a project consisting of Tankian, himself, and Arto Tun?boya?iyan, an Armenian friend of Tankian's. Tankian is also very involved politically. Together with Tom Morello (ex-Audioslave, Rage Against the Machine, The Nightwatchman), he founded the organization Axis Of Justice. Tankian often speaks publicly against violence and injustice in the world. Serj is a vegetarian and likes to read poetry but other than that, few details are known about Tankian's private life. He is especially interested in Shakespeare, T.S. Eliot and Edgar Allan Poe. Serj hates celebrity gossip. He believes it is a waste of time and due to the spreading of rumors, can destroy close relationships . Two days after the attacks on September 11, 2001, Serj posted a highly controversial essay on the band's website. It was promptly taken down by Sony, the band's record label. Sony's opinion was that Tankian had tried to justify the terrorist attacks and that his claims were unfounded. Tankian's first poetry book, Cool Gardens, was published by MTV Books and released on October 1st, 2002. It is a collection of seven to eight years of Tankian's reflections on life, and features artwork by fellow Armenian, Sako Shahinian. The book has received much praise in the artistic community. 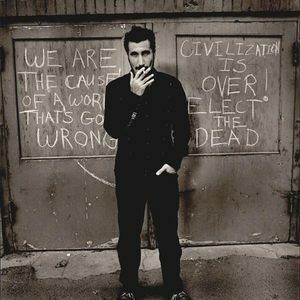 In late 2007, Serj released his first solo album "Elect the Dead" Serj later went on to perform live around the world on a tour to promote his solo album, backed by another band on his label, the FCC (Flying Cunts of Chaos). In 2010, Serj released a live album "Elect the Dead Symphony" during which he performed with the Auckland Philharmonic Orchestra. Afterwords, they embarked on a worldwide tour with the orchestra. In September of 2010, Serj released another solo album "Imperfect Harmonies" through Serjical Strike Records, his record label. In December of 2010, it was announced by fellow members of his band System of a Down that they would be reuniting for a world tour in 2011. Fellow bandmate Shavo Odadjian released through his Twitter account that they would reunite. In May of 2011, they began their worldwide tour in Canada, with stops in America, England, Germany, Finland, Sweden, Austria, and Russia. They will also be heading to South America to play in Brazil, Argentina, and Chile. The Figure It Out Songfacts reports that Serj's third solo album, "Harakiri" will be released on July 10, 2012. The lead single, "Figure it Out," was released on May 1, 2012.